You have found the best in class product that is the leader RV buyer expectations. For almost 20 years, the Cherokee division of Forest River has produced quality products, and recently has become the leader in Forest River’s retail selling (2017 Statistical Surveys data). 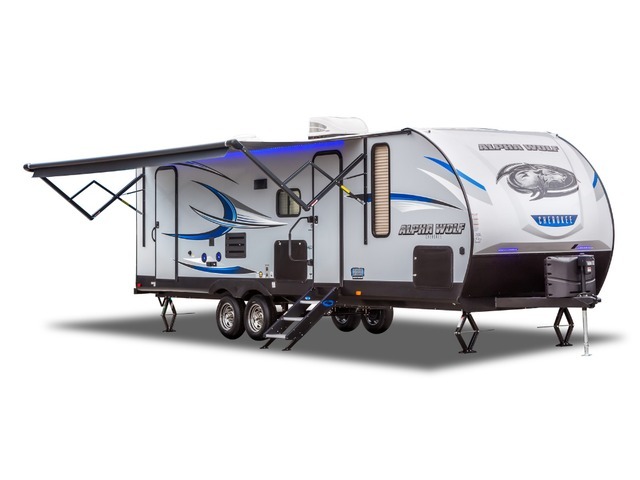 The all new Alpha Wolf is the first in the Cherokee laminated travel trailers. Laminated trailers are lighter, very well insulated, and provide the clean exterior look that folks have been demanding. Dry Weight 5,392 lbs Hitch Weight 600 lbs Overall Length 29' 4"
Dry Weight 5,795 lbs Hitch Weight 600 lbs Overall Length 31' 6"
Dry Weight 7,088 lbs Hitch Weight 740 lbs Overall Length 34' 3"
Dry Weight 6,156 lbs Hitch Weight 627 lbs Overall Length 33' 6"
Dry Weight 6,543 lbs Hitch Weight 900 lbs Overall Length 36' 8"
Dry Weight 6,780 lbs Hitch Weight 920 lbs Overall Length 36' 8"